Read and understand the way humanity will be living as we progress. A lot of this is a throw back, but at the same time child birth today is generally successful. Their not preparing youth for roles in our integrated society is not a good idea. However, we also fail in that regard for over half of our population. They can do better and we need to do much better. What is most important that they are all ideally positioned to operate in the post industrial agricultural economic model, although even then they are not obviously leading us out. In time we will master our agricultural biome and manpower will be augmented with inexpensive robots quite up to the challenge of supporting our efforts. During the growing season optimizing the majority of production does need skilled human involvement and generally plenty of it. The problem has always been to find a balance between the large numbers needed for production and the scant numbers needed at other times. My solution is to use the operation to capitalize alternative production outside those periods of intense activity and let folks figure it all out. This also includes employing all age groups in the internal money economy. Thus adults can leave an established position to contribute elsewhere in the knowledge that on his return on retirement for example, he has a place to slip into and continue to participate. In the Amish way, everyone has a place and no one is exploited. That was not the historical history of agriculture which is why it became so unpopular and difficult to change. Now I think that we can. We must recall that the promise of modernity promises great rewards for the best and brightest and a decent living for the top two thirds of the population. Unfortunately, it is pretty clear by puberty just who is going to make it. The bottom third knows this and having a natural failsafe in place optimizes their ultimate contributions. Modernity as it has historically developed tore families apart and separated them from their natural community. The Amish have evaded this fate by been simply slow to join modernity and by preserving families through their agricultural lifestyle. Practitioners of one of America’s fastest-growing and dynamic religious communities still get to Sunday services by horse and buggy. The country’s famously technology-shunning “Old Orders” Amish may appear vulnerable in an age of iPads and instant global communication, but a comprehensive survey suggests that the nation’s Amish religious communities are in fact thriving, with a settlement founded every month on average in dozens of states across the country. A combination of traditionally high birthrates and falling defection rates among adults — more than 4 in 5 people raised in Amish homes now opt to stay within the community — has led demographers to predict that the number of Amish communities in the United States will double over the next 40 years. Amish families are dispersed across 29 states — stretching from Montana to Florida — within 456 autonomous settlements, a sharp increase from the 179 settlements listed in the 1990 census. Analysts see no reason for this trend to slow and project the number of believers to approach 1 million by the late 2050s. The religious census, authored by a team of researchers from Ohio State University, cites those high birthrates and an unprecedented retention rate within the communities as the main reasons for the rapid growth. 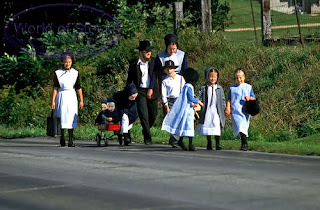 The Amish shun contraception, and families average six to seven children. Despite the temptations of the outside world, more than 250,000 people live within Amish settlements, the study reports, and about 85 percent in the younger generation continue the way of life once they reach adulthood. The Amish were part of an ultraconservative Anabaptist movement born out of the Protestant Reformation in the 16th century, and are known in mainstream society for traveling via horse and buggy and refusing or strictly limiting their use of electricity and other modern conveniences.Amish settlements emphasize close-knit communities where households, not churches, hold communion on a rotating basis, and where the main occupation traditionally has been farming because it allows men to remain near their families. The Amish believe in adult baptism — the main reason the movement broke with other Protestant groups in the 1600s, when churches began baptizing babies in part to monitor population for tax and military purposes. Mr. Donnermeyer said that since World War II, the percentage of Amish youngsters who have reached this final stage of baptism has skyrocketed, and reflects in large part the growing distance between mainstream society and Amish ways. More than a century ago, the gap between the Amish way of life and those of surrounding rural communities was not large. Now, the chasm between the Amish way of life and that of the “English” — the term often used to describe non-Amish neighbors — has become much harder to cross. The Amish traditionally are associated with Pennsylvania as well as Midwestern states such as Ohio, which together account for about 40 percent of the total U.S. Amish population. In Ohio’s Holmes County, 42 percent of the population is Amish. LaGrange County in Indiana is another largely Amish area, with 37 percent. The Greater Holmes County settlement, which sprawls across six counties (Holmes, Wayne, Tuscarawas, Coshocton, Stark and Ashland), is the largest settlement, with nearly 30,000 Amish, followed by the Lancaster/Chester County settlement in southeastern Pennsylvania. “My guess is that in 15 years, we’ll witness a county whose population is majority Amish, and Holmes County is likely to gain that distinction first. Perhaps LaGrange County in Indiana will not be far behind,” Mr. Donnermeyer said. Even so, the Amish continue to expand into several other states. New York in particular has gained more than 15 settlements in the past three years, and Missouri, Michigan, Iowa, Wisconsin and Kentucky each now have more than 20 settlements. Amish families have started arriving in states even farther afield, including Colorado, Arkansas, Montana and Maine. “The Amish are taking advantage of land prices, so they are often locating in rural counties that have been declining, both economically and in terms of population size,” Mr. Donnermeyer said. Amish community leaders also say they see growing clusters of farms and settlements, with newly married couples tending to stick closer to the parental family farm. The migration of Amish families to these counties can mean significant changes for those communities, according to the study, despite the principle of Amish communities of keeping to themselves. Despite the potential for conflict with existing communities, Mr. Donnermeyer said, the impacts of the Amish have been seen as generally positive. Amish migration “slows down the population decrease and could even turn it around. The Amishhave very low unemployment and [are] good entrepreneurs. They have positive economic benefits to counties,” Mr. Donnermeyer said. Many Amish families no longer consider farming as their sole occupation because they often cannot find and maintain enough land to sustain themselves. In response, many families have turned to other crafts, such as carpentry and construction, to earn income. The emphasis on being close to family remains, however. Well, will we see SWAT raids by the FBI, the FDA and the whole alphabet of jackbooted thugs trying to tear down these communities and force them to adopt the codex alimentarius? I don't see any Govt toleration for different values in the USA of today, especially if you are dealing with raw milk or home-grown produce..